I learnt a lesson on buying cheap. 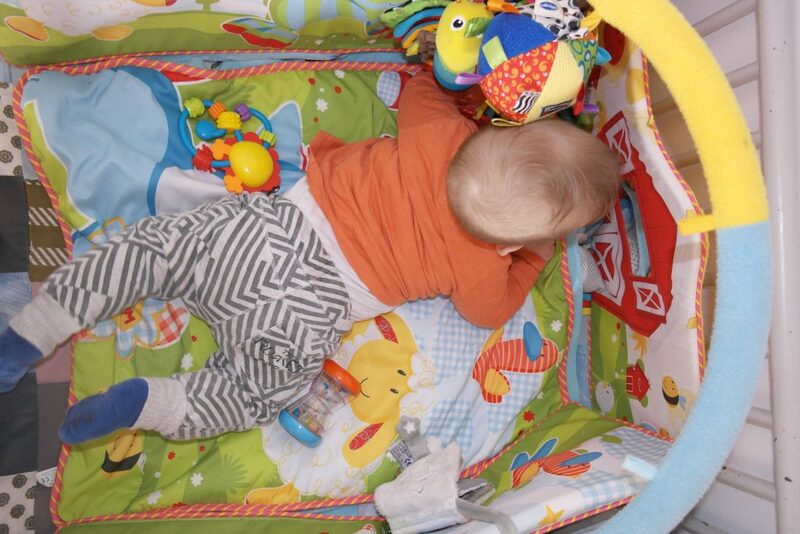 It is this; we bought a baby-gym, the cheapest. And, well, after a few lovely babies playing in it, I still don’t really like it. Now I made him a new one, at lot prettier! Yey for me! It should also work better for him now that he is bigger. Yey for him! baby gym, mind the bow-ties! So, the old baby gym has sides. I wont do that as this is what made the thing too small too soon. I will use the sides of this playing-pen instead so he has all the room he wants. I will first make the overhead-part of the gym, with different kind of loops that hold the toys. Than I will make two bow-ties to knot it too the pen in a novel way. 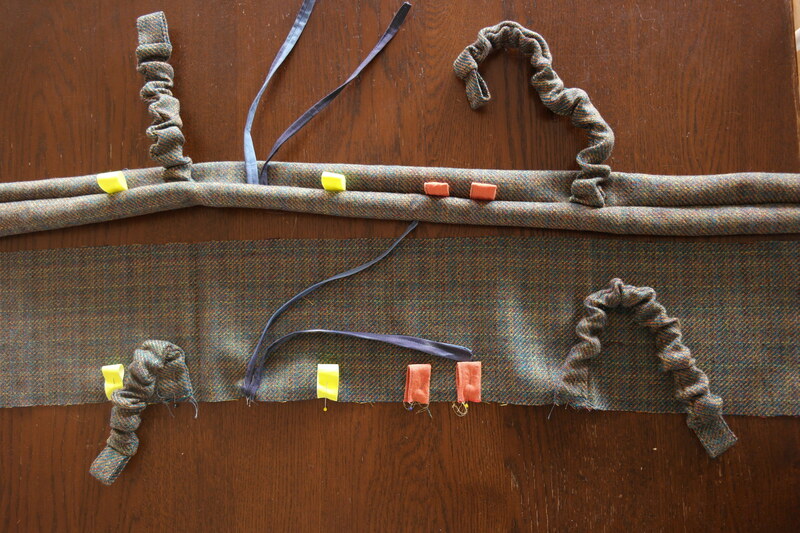 I will explain this, and how I adjusted the bow-tie pattern, in the end of the blog. 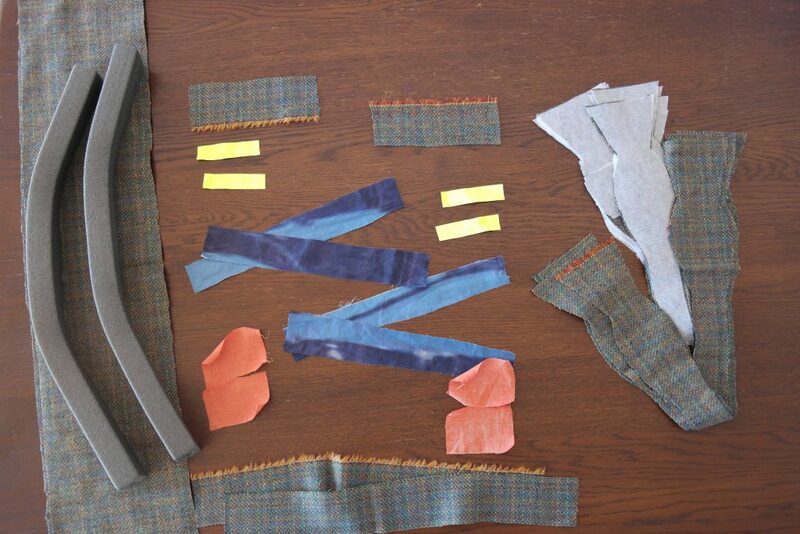 What you need for a start, arguably the most important part, is a nice piece of fabric. I tried to match it with a quilt my grandma made from old pieces of fabric. This quilt is always in the bottom of the paying pen. grandma-made quilt and blanket, sister in law made Amigurumi (mirror/pig/cow). 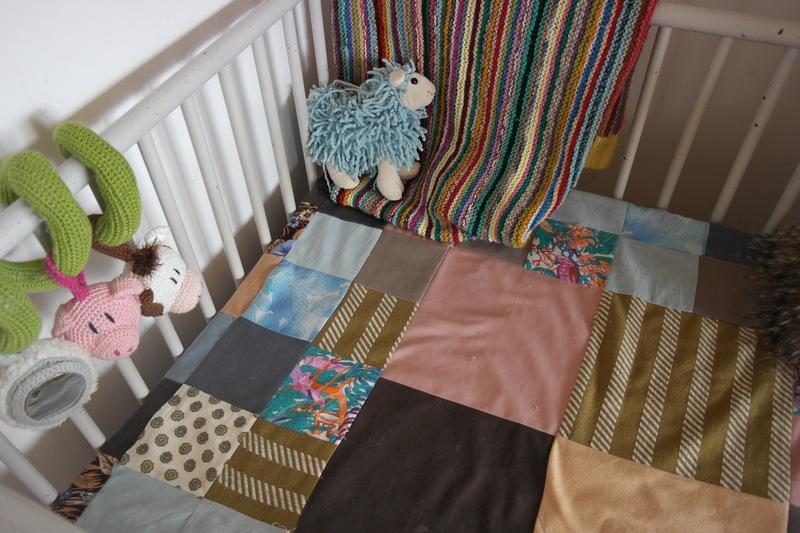 While I was doing this, I also kept an eye out for complementing and colourful scraps of fabric to use for the loops that, when finished, hold the toys. This is like with any other baby gym. I obviously made these beforehand so I could stitch them into the seam when finishing the entire thing. Now this is were you can start to be creative, but only as far as safety allows. I do not want to make a list that is pretty much the same on any kids toy. Probably the two most important rules to follow are: do not create loops that can scoop up heads/legs/hands. The baby won’t be able to get out as the child doesn’t understand these things yet. Last but not least, make sure everything is fastened. If you can not guarantee it is really very sturdy, do not use it. I am talking about things like buttons/bells etc. This might make it look very pretty, but you never know when they can reach them and swallow them the wrong way. If it is anything I have learned, it is that kids can be unpredictable. Okay, I am going to stop here. Please know the safety of this baby-gym is entirely up to you, eveybody is responsible for their own creations! 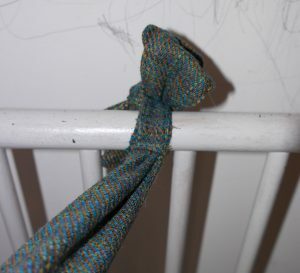 Make sure the loops are attatched really well, if the baby pulls them from the fabric it is tedious to get them back in place. As you can see from the pictures I also put in some elastic, these parts I like the best. It means a kid can reach for a toy, can drop it, but it will always stay close at hand, to drool over it again! But make sure the fabric surrounding the elastic is wide, so getting entangled in it is difficult. I also added two stings of fabric that are more like cord. These should not pose a risk when they are not knotted. 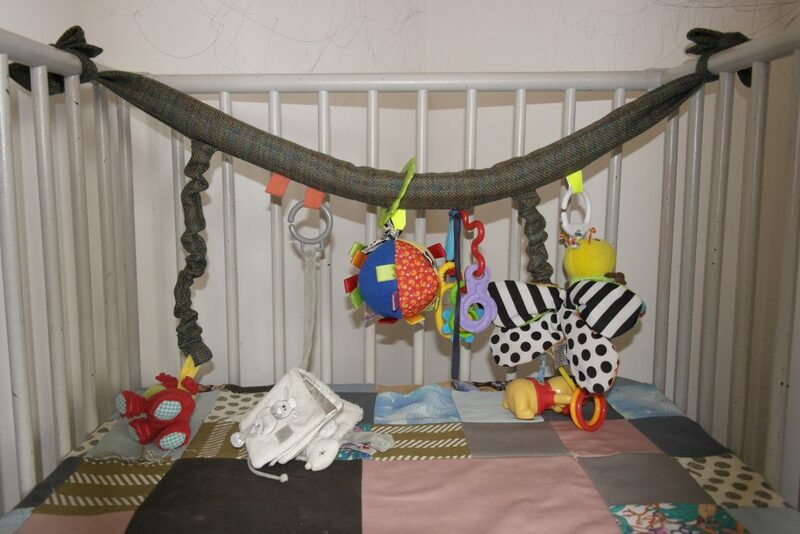 And I need make sure when I add a toy to knot it tightly at the top of the baby gym and not lower, so it does not create a loop. Please note that these things are definetely not on a safe-for-babies list. But I took some liberty here. While I am sure the main bar could work without anything in it, I had a piece of foam left from some packing we received. You could also try filling it with fabric, or rolled-up paper. Now for the bow-ties! I took a quick look at http://www.tie-a-tie.net/bowtie/ in order to find how to tie a bow-tie. It has a nice clear description. Even better, it has a pattern! If the pictures I have here inspire you to also close you baby gym with a real (!) bowtie, head to this page: http://www.tie-a-tie.net/make-a-bow-tie/ and download it form them like I did. Now the pattern has a part that speaks about inches. On a regular bow-tie this is the collar of the shirt you make the bow-tie for. Naturally I make the bow-tie for a wooden-bar rather than a neck. So this part should only be as long as the wooden-bar is thick. Now, make one pattern part like the tutorial on the aforementioned website, and one part you make in two, with seem-allowance. 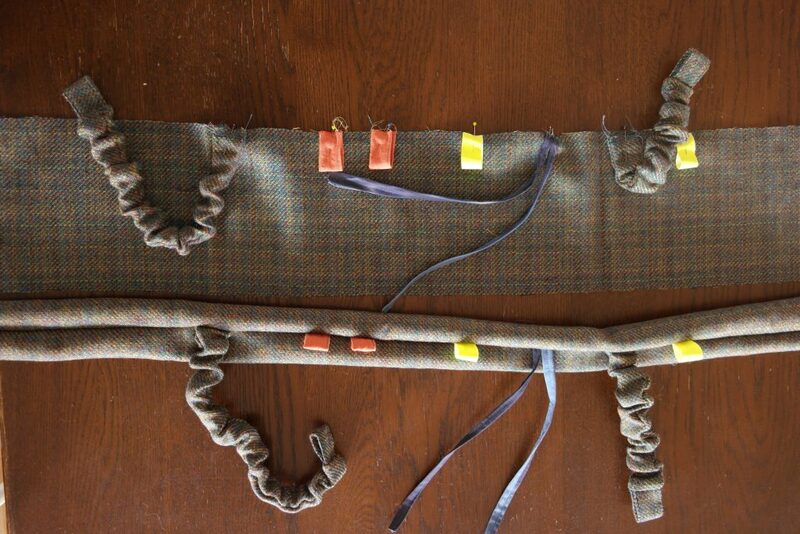 This way you can neatly stitch the fabric-bar into the bow-tie! He seems to be happy with the product of today! I sure think his play-pen looks better than before and he can have fun with this one from now on, as he can crawl and turn himself over as much as he wants. I am sure, though that at one point also this new product will no longer be interesting to him! Posted on February 27, 2017 by Marjolein. 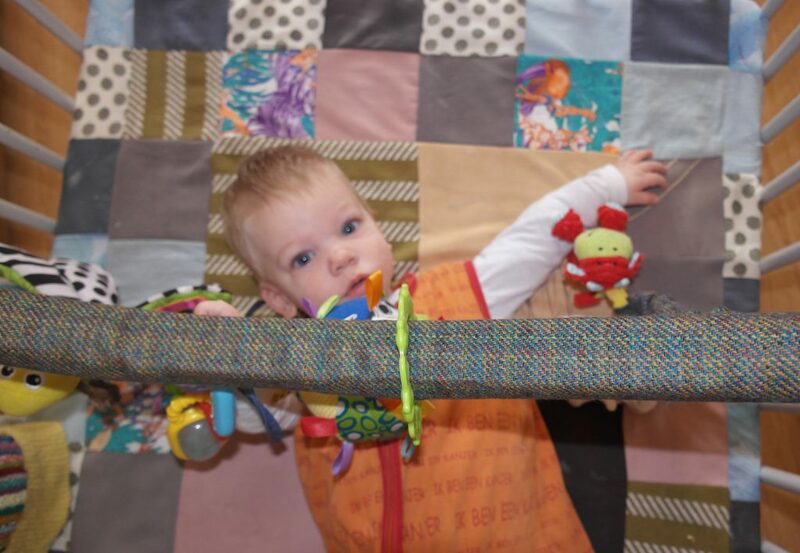 This entry was posted in upcycle and tagged baby, baby gym, handwork, homemade, inspiration, sewingmachine, toys. Bookmark the permalink. Wauw Lijn, it looks great!! nice to see your little one playing in your new creation. what I liked most was the colourful bits where everything is attached to. Good of you not to take any responsability in case people are not working the safe way. greetings and looking forward to your next creation.